Hattie Wyatt Caraway served for 14 years in the U.S. Senate. She was the first woman to be elected to a seat in the United States Senate. Born in Tennessee in 1878, she entered Dickson Normal College at age 14. For several years, she and her fiancé Thaddeus Caraway taught school. The couple married in 1902. A fiery orator, Thaddeus, became politically active in Arkansas. He served as a prosecuting attorney before serving four terms in Congress. In 1920, he ran for, and was elected to the US Senate. In 1931, Thaddeus Caraway died. Arkansas Governor Harvey Parnell appointed Hattie Caraway to fill out the remainder of her husband’s term. She had been a trusted adviser to her husband and worked hart behind the scenes in his campaigns. While she later downplayed her political involvement (apparently to appear as a “poor, little widow”), she had been active in her campaigns and during his service in Washington. After the appointment, Governor Parnell also endorsed her for the special election to fill out the remainder of the term (which expired in fourteen months). By winning that over two independent candidates, Hattie Caraway made history as the first woman to be elected to the U S Senate. Few, if any, in the Democratic establishment expected Hattie to run in the 1932 election for a full Senate term. Most of the state’s political heavyhitters had an eye on the seat. To their surprise, on the last day to file for the Democratic primary, she threw her hat in the ring against six men. Without the backing of the Arkansas Democratic political structure, she called upon her friend from neighboring Louisiana, Senator Huey P. Long. Not only was he glad to help an ally, his chief rival in the Senate was Arkansas’ other senator, Joe T. Robinson. Long positioned her as a champion for the downtrodden. This seemed to work, she received 44.7percent of the vote and carried 61 of 75 counties. Caraway set a number of firsts for women in the Senate. In 1933, she was named chair of the Enrolled Bills Committee; the first woman ever to chair a Senate committee, she remained there until she left Congress in 1945. 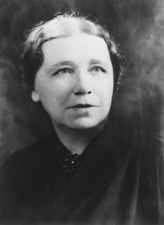 Caraway became the first woman to preside over the Senate, the first senior woman Senator (when Joe Robinson died in 1937), and the first woman to run a Senate hearing. Most observers, including some of her supporters, believed Caraway would retire in 1939. But she upset expectations again by declaring her candidacy for the 1938 election. In the Democratic primary, Caraway faced two–term Representative John L. McClellan, a 42–year–old lawyer who declared, “Arkansas Needs Another Man in the Senate.” Senator Caraway ran on her record of supporting New Deal legislation to alleviate the economic hardships for the state’s largely agrarian economy. She eked out a victory of 8,000 votes out of the 260,000 cast. In her quest for a third term, Caraway finished fourth of the four candidates. J. William Fulbright won the seat. President Roosevelt and President Truman appointed her to positions in their governments. She continued her public service in those capacities until her death in 1950. Mr. Heiskell is the person most responsible for Robinson Center Music Hall being located at the corner of Markham and Broadway. As Chair of the Planning Commission and editor of the Arkansas Gazette he had twin bully pulpits to promote this location when those on the City Council (who actually had the final say) were looking at other locations. He felt the location would help create a cluster of public buildings with its proximity to the county courthouse and to City Hall. Mr. Heiskell finally succeeded in winning over the mayor and aldermen to his viewpoint. Governor George Donaghey appointed Heiskell to succeed Jeff Davis in the United States Senate after Davis’s death in office. Heiskell served from January 6, 1913, until January 29, 1913, when a successor was chosen by the Arkansas General Assembly. His tenure is the shortest in the U. S. Senate history. His first speech on the Senate floor was his farewell. He was also only the second US Senator to live to be 100. In 1907, he joined a successful effort to build the city’s first public library. He served on the library board from that year until his death and was issued the first library card. He also served on the City’s Planning Commission for decades. In 1912, he was instrumental in bringing John Nolen to Little Rock to devise a park plan. Mr. Heiskell donated his vast papers to UALR. They are part of the Arkansas Studies Institute collection. These papers give insight into not only his career as a journalist, but also his political and civic affairs. Thankfully he saved much of his paperwork. Without it, much insight into Little Rock in the 20th Century would be lost.